Before you meet your new Girl Scout Cookies, let’s take a few minutes to appreciate how this tradition got started and how it has come to be such an important part of the Girl Scout Journey. Girl Scout Cookies got their start in the kitchens of Girl Scouts as early as 1917 – five years after Juliette Gordon Low started Girl Scouting in the United States. In July 1922, a director in Chicago, Illinois provided a simple sugar cookie recipe in The American Girl Magazine that had been given to the council’s 2,000 Girl Scouts. These cookies could be made and sold by troops for 25 or 30 cents per dozen. Throughout the 1920s and 1930s, Girl Scouts in different areas continued to bake their own cookies with their mothers. These cookies were packaged in wax paper bags, sealed with a sticker, and sold door to door. In 1934, Girl Scouts of Greater Philadelphia Council took cookie sales to the next level, becoming the first council to sell commercially baked cookies. By this time, enthusiasm for Girl Scout Cookies spread nationwide. In 1937, more than 125 Girl Scout councils reported holding cookie sales. Cookies sales were strong up until World War II. During this time sugar, flour, and butter shortages led Girl Scouts to begin selling calendars to raise money for activities. After the war, cookie sales resumed, with the national organization licensing local bakers to produce and package cookies. By 1948, a total of 29 bakers were licensed to bake Girl Scout Cookies. In 1951, Girl Scout Cookies came in three varieties: Peanut Butter Sandwich, Shortbread, and Chocolate Mints (now known as Thin Mints). Five years later, flavors branched into four varieties: a vanilla-based filled cookie, a chocolate-based filled one, shortbread, and a chocolate mint. During the 1960s, when Baby Boomers expanded Girl Scout membership, cookie sales increased significantly. Fourteen licensed bakers were mixing batter for thousands upon thousands of Girl Scout Cookies annually. In 1978, the number of bakers was streamlined to four to ensure lower prices and uniform quality, packaging, and distribution. 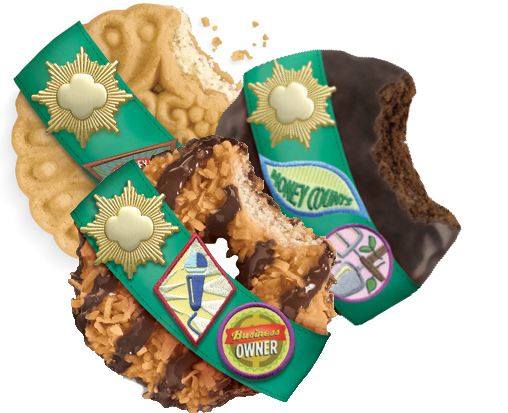 For the first time in history, all cookie boxes—regardless of the baker—featured the same designs and depicted scenes of Girl Scouts in action, including hiking and canoeing. Cookies for sale during the 1970s included Thin Mints, Peanut Butter Sandwich, and Shortbread cookies. In the 1990s eight cookie varieties were available, including low-fat and sugar-free selections that never sold well enough to continue producing. Early in the 21st century, every Girl Scout cookie had a mission. New cookie box designs, introduced in fall of 2000, were bold and bright, capturing the spirit of Girl Scouting. And, much to the excitement of our youngest Girl Scouts, Daisies started selling cookies! Click the banner to sign up for the Meet Your Cookies Event!